Batu Caves is located in Gombak area in state of Selangor. It is about 13 km from Kuala Lumpur. Batu Caves was know to the villager there especially chinese settlers since early 1860s. The went there to collect guano. There no record until William Hornaday started recording about it in 1878. Batu Caves consists of a few caves. 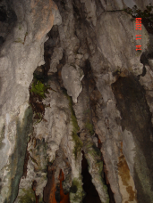 The main cave is the Temple Cave and is situated about 100m above ground. This cave was made popular by Thamboosamy Pillai who put a murti/statue of Lord Murugan there. The entrance into this cave can be reached via 272 concrete steps. Walk through this cave to go to the shrine where the murti/statue of Lord Murugan is placed. There is another cave called Dark Cave situated a little below the Temple Cave. It can be reached at step 204 of the concrete steps. 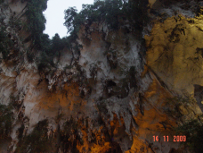 It was said that this cave is the biggest in Batu Caves and has 7 chambers. At the foot of the hill, there is a big statue of Lord Murugan. The statue is about 42.7m tall, tallest in the world. It was completed in Jan-2006. Then there is a Gallery Cave with Hindu paintings and statue. In the far left of the foothill, there is another cave called Ramayana Cave dedicated to Hanuman, the monkey. I did not go to this cave so no photos.